SyncToy is one of the so-called "PowerToys" that Microsoft offers to power users for free. It is a small utilities that enhances and streamlines working with Windows in several ways. More specifically, it allows you to perform directory synchronization jobs much more quickly and conveniently than if you were just using the Windows Explorer. 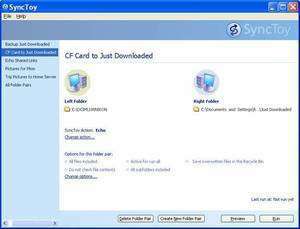 SyncToy has several synchronization options that cover all the possibilities in regard to copying, moving, renaming, overwriting or merging files together. For security reasons, you should also check out the SyncToy download at LO4D.com which includes virus and malware tests. Additional screenshots of this application download may be available, too. SyncToy download been highly rated by our users.